Not much change in the monarch situation on Wednesday. South winds kept monarchs from moving into Cape May Point and it's likely that some drifted off the Point to spots a bit further north. Those same southerly breezes kept the remaining monarchs off the beach and dunes and in the sheltered gardens around the Point. Still, 2012 is proving to be a year of abundance for monarchs along the Atlantic Flyway, and there are still lots of monarchs to be seen here. We had plenty for today's tagging demo, much to the delight of those in attendance, as illustrated below. Winds look to become gradually more favorable for monarch migration in the coming days, with a big monster of a cold front due sometime during the weekend. We're hoping for at least one more big wave of monarch migration when the winds change; stay tuned for updates. Lynn Lee & Julia Druce took the lead at Wednesday's tagging demo. 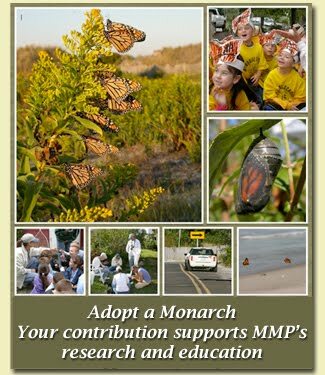 Nobody is too young to marvel at a monarch butterfly! Patsy Eickelberg tags a monarch while two eager students observe. The last step of the tagging process: release back into the wild!